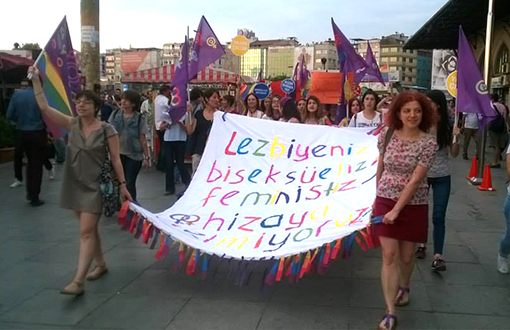 Lesbian and Bisexual Feminists were gathered on 15 July in front of the Kadıköy Pier to protest the police attack on the Pride Parade. Women pointed out that hate speech against LGBTIs are being disseminated with religious excuses and stated that this behavior imprisons women in the male dominated family, love and sexuality. At the press release read before the march from the Pier to the Bull Statue, they said that the reason for the attack LGBTI activist Kemal Ördek was exposed to is the AKP government which targets LGBTIs.